Obama Gets Liberal Help On Libya Against Progressive Critics : It's All Politics President Obama's Libya decision has drawn harsh criticism from some liberals, including Rep. Dennis Kucinich who even raised the specter of impeachment. But other liberals are defending the president's decision. 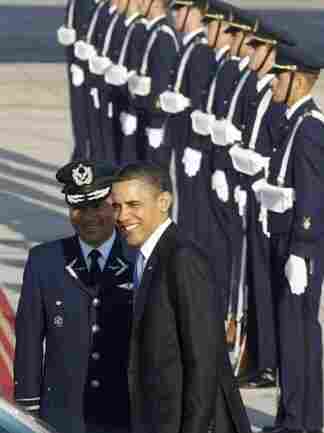 President Obama poses with Chilean Air Force officer before leaving Santiago, Chile, Tuesday, March 22, 2011. Not all liberals are going negative on President Obama for ordering U.S. military action in Libya, like Rep. Dennis Kucinich (D-OH) who had the albeit extreme reaction of raising the possibility of impeachment. Indeed, the president is getting important political cover on his left flank from liberals arguing that he chose perhaps the only available course that remained. (1) That gangs of mercenaries, financed by the country's oil wealth, conduct a bloodbath against Muammar Qaddafi's many opponents? (2) That Qaddafi himself, wounded, enraged, embittered, and still in power, retain control of an important source of the world's oil supply, particularly for Europe, and be able to spend the wealth he derives from it to sow discord in the region? (3) And that the movement toward democratization in the Arab world—which has spread from Tunisia to Bahrain, and now includes such unlikely locales as Syria—be dealt an enormous setback through the survival of one of region's most notorious autocrats? If you answer "Who cares?" to each of these, I have no counter-arguments to offer, but if you worry about two or three of these prospects, then I think you have to reconsider whether Barack Obama did the right thing in lending American support to this intervention. There is no perfect formula for military intervention. It must be used sparingly — not in Bahrain or Yemen, even though we condemn the violence against protesters in both countries. Libya is a specific case: Muammar el-Qaddafi is erratic, widely reviled, armed with mustard gas and has a history of supporting terrorism. If he is allowed to crush the opposition, it would chill pro-democracy movements across the Arab world. Well-known blogger, Middle East expert and University of Michigan professor Juan Cole, does his version of David Letterman, giving ten reasons why the intervention ordered by Obama differs from the 2003 Iraq invasion, a comparison some liberals have made. 10. Iraq in 2002-3 no longer posed a credible threat to its neighbors. A resurgent Qaddafi in Libya with petroleum billions at his disposal would likely attempt to undermine the democratic experiments in Tunisia and Egypt, blighting the lives of millions.